When I was growing up, Mom used to give away Poinsettias for the holidays. It was a promotional give away that she'd do to keep her name in with potential customers as a part of her real estate business. The holiday season would approach and one night we would get a delivery of around 100 poinsettia plants, wrapped in brown craft paper. Our living room would be stuffed with these brown cylinders, each of which contained a flowering plant that would be given to a prospective client. My sister and I were allowed to keep one, and I managed to keep mine living for a while. Eventually it would turn green, slowly it would lose leaves and then would end up being put outside to add soil to the gardens. This being New Jersey, poinsettias simply didn't have a chance to survive the winter. Here, people actually have them growing outdoors. They can grow to be a pleasant looking shrub, and add a bit of color to the yard. Every one I have been given in the four years I have lived here are on the property still in some form, either in pots or in the ground. After the season is over, the businesses in the area have a habit of throwing theirs out. The holidays are over, you need to make room for the next shopping season. I haven't seen valentine hearts yet, but the poinsettias are long gone. I have picked up some of them and put them in pots after they have been cast off. Mostly they're missing leaves and are just the crown of bright leaves and a scrawny stalk, but after being outside on the drip feed irrigation, they fill in quite nicely. I don't have to worry about the plants because in Wilton Manors, a poinsettia is pretty much about as carefree a plant as I can hope for. 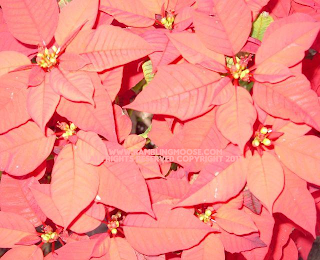 The picture above is a three year garbage poinsettia. It was on death's door when it was found, put into a big pot in the back yard on the drip feed irrigation line, and it's thriving. When I look out my window at dawn, I am treated to a shock of red and pink just like you see here. It is joined by two poinsettias that were given to me over the last two years from my godmother and her husband, Kathie and Larry. This year's poinsettia is front and center in the garden in front of the house. In the clean green land of Florida, as the state used to bill itself on the maps, a little shock of color is a nice thing, even in a place named after flowers.